Male female standoffs are used to hold two components at a given distance from each other and are used as spacers when mounting or positioning circuit boards, panels, doors, gears and other electronic components and hardware. Male female standoffs are either hexagonal or cylindrical in diameter, have an opening with a partial internal thread at one end, and an externally threaded post at the opposite end. They are used when one end of the component is internally threaded. Male female standoffs are made with steel, aluminum, stainless, brass, or plastic/nylon and may also have exterior knurling or swage characteristics. RC Fasteners & Components is your source for superior quality male female standoffs at competitive prices. We offer hexagonal male female standoffs in a variety of threads, lengths, materials and finishes. Our inventory of low price standoffs is bound to keep you coming back! 3/16 Hex Male-Female Standoff in lengths from 3/16” to 2” and available in steel, stainless or aluminum. 1/4 Hex Male-Female Standoff in lengths from 1/4” to 2” and available in steel, stainless, aluminum or brass. 5/16 Hex Male-Female Standoff in lengths from 1/4” to 1” and available in aluminum or stainless. 1/2 Hex Male-Female Standoff in lengths from 1/2” to 4” and available in steel, aluminum or stainless. Aluminum is popular for its lightweight / strength compromise. It’s non-magnetic, performs well in severe temperatures, and has insulating properties. Brass is used in making high quality standoffs. It is costlier and heavier than aluminum and is usually plated zinc or nickel. Brass male female standoffs are conductive, nonmagnetic, and resist corrosion. Nylon is nonconductive and a good insulator and has a surface smoothness that will not fray the insulation of wires that rub against it. Stainless is conductive, non-magnetic and has the advantages of brass but has superior resistance to corrosion and chemical fumes. Steel is used in applications requiring greater strength, but is heavier than aluminum and does not resist corrosion like aluminum, brass or stainless standoffs. 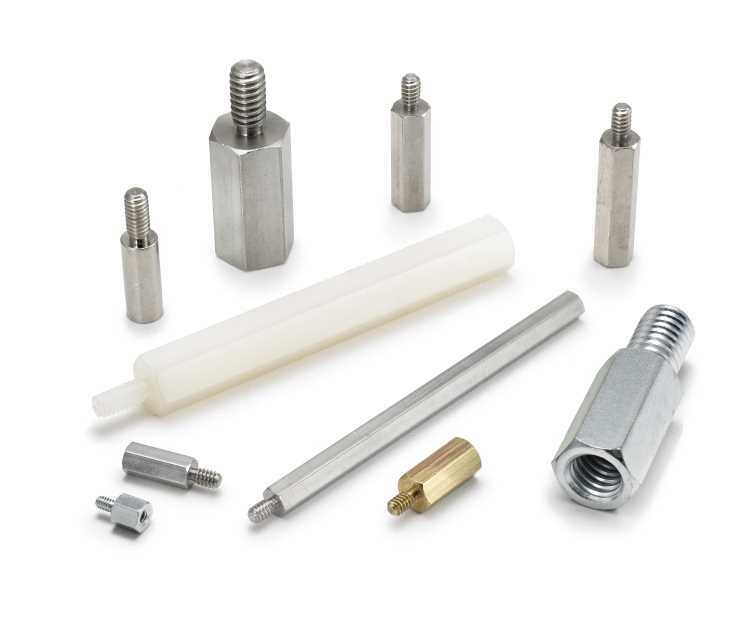 RC Fasteners & Components offers a variety of quality, low price standoffs. Place your order for male female standoffs today or contact us to request a quote or learn more about our products.